In the field, mobile workers read, enter, and update forms. In Collector, the form is based on the feature or table's pop-up, and the entries are driven by how you prepared your layer. To configure both the readable form view and the editable form, configure the pop-up while creating the map. While the contents of the read-only pop-up can use different displays (such as a custom display), the editable pop-up always uses a list of attributes and values, like a paper form. The list provides the mobile worker with a familiar form experience and confidence that they are editing the right part of the form. GIS managers think of the information about features (and tables) as fields and their values as attributes, and the display as a pop-up. However, mobile workers think about assets and observations, and conceptualize the information as a paper form with entries. To encourage GIS managers to communicate in ways most easily understood by mobile workers, this topic uses the terminology used by mobile workers to get GIS managers familiar with their thinking. The exception is when terms from the authoring experience are used. For details on how to configure forms, see Configure pop-ups in ArcGIS Online or Configure pop-ups in ArcGIS Enterprise. In Map Viewer, configure the pop-up to configure the form. In the browser, open your map in Map Viewer, click Details, and click Content. If you haven't made your map yet, see Make a map. Browse to the layer or table that you are making a form for, click More Options , and click Configure Pop-up. Including the right identifying information in the title makes it easier for your mobile workers to choose the right form to read or update. The pop-up title is used to display your form in lists (such as when multiple items on the map are tapped, or there are multiple search results). In the title, make use of Arcade attribute expressions to get the information your mobile workers need, formatted to be the most useful for them. See Use attribute expressions in ArcGIS Online or Use attribute expressions in ArcGIS Enterprise. There are multiple entries that need to be scanned and quickly identified—Use A list of field attributes, configured to promote the key information. While you can specify that an entry be visible in the read-only form but not the editable one, all other configurations apply to both the read-only and editable forms when using a list for the read-only display. This includes order, aliases, and formats. A single entry is needed—Use A description from one field to highlight that information. There is a different display the mobile worker would be most familiar with, such as a phrase used to communicate the key information—Use A custom attribute display and create the phrase using various entries. The title has all the necessary information, and nothing else needs to be read—Use No attribute information to avoid cluttering the app with unnecessary information. Your form should be ordered to make it easier for the mobile worker to provide the information in the field. If you have a long form, but only some parts are required, you can list those first so that the mobile worker doesn't have to search for the key items. If you have related information in the form, it should be grouped near each other, similar to sections of a paper form. If you use a list for your read-only display, the same order is used when editing. Under These field attributes will display, click the entry you want to reorder. Use the arrow keys next to the list to move the entry up or down in the list. A good form contains the entries mobile workers need. It shouldn't include extra information that clutters the form or distracts mobile workers. For example, if your data includes GPS receiver information, the mobile worker shouldn't be able to edit it. They might not need to view it, either. 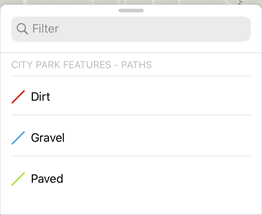 When authoring your map, configure the form to specify what is included in the read-only view, as well as which entries are editable and included when editing. While configuring the pop-up, click the Configure Attributes link. Check the Display check box for entries mobile workers need to see in the read-only pop-up. Check the Edit check box for entries mobile workers need to fill out or update. You can uncheck the Display check box but check the Edit check box if the entry is only useful while editing. Collector uses the Field Alias text as the label of the entry in the form. Provide a name or short question familiar to your mobile workers. Keep labels short and concise. While you can use a question, Collector scales the text to fit on a single line in the form, so long labels are in a small font that may be harder to read. Click the current alias text for the Field Alias you want to change. Type the new alias and press Return. Collector uses the Hint text when editing to display informative text for an entry without a value. For example, you can provide information about where the mobile worker obtains the information or details of the format it should follow when entered. Click the field name of the entry where you want to provide a hint. In the Hint text box, type the information mobile workers need to see before filling out the entry. Text entries can be configured to use single lines, multiple lines, or rich text. This configuration is used when viewing the form, but Collector always uses a single line of text during editing. Click the field name of the text entry you want to format. Under TextBox Type, choose the format for your text box: Single Line, Multiple Line, or Rich Text. The format displays in the read-only form. Numeric entries can be configured to use a specific number of decimal places and to use a thousands separator. Consider the size of numbers your mobile workers need to provide. Click the field name of the numeric entry you want to format. Under Format, choose the number of decimals your data should display, from 0 to 8. If you want your data to include a thousands separator, check the Use 1000 Separator check box. Dates can display in different formats. If time is important to your data, choose a date format that includes time and configure the time's format. If time isn't important, you can hide it. Click the field name of the date entry you want to format. Under Format, choose the format your date should display, for example, 12/21/1997 or Sunday, December 21, 1997. Collector uses the locale of your device when displaying the date. The format you choose in the pop-up configuration determines the information included in the date, not the exact display. Choosing 12/21/1997 or 21/12/1997 in the pop-up configuration results in the same display in Collector, with the device's locale determining the final result. If your format supports time, and you'd like to display or edit it, check the Show time check box and choose the format for the time, for example, 6:00 PM or 18:00:00. Collector displays and edits using local time. You can calculate entries based on formulas and other parts of the form. For example, do unit conversion and include trailing text to show units, combine multiple entries for a more intuitive read, or specify a custom format. Calculated entries are created by adding an Arcade attribute expression that performs the calculation. The calculated entry is included under Pop-up contents like any other field and can be used to build your read-only form. Since it is a dynamically calculated value and is created based on other entries, it won't be editable or visible during editing, but the read-only form updates to reflect edits made. See Use attribute expressions in ArcGIS Online or Use attribute expressions in ArcGIS Enterprise. For example, the steps below show how to make a calculated entry indicating if an asset needs to be inspected. If not inspected in the past year, the title of the form updates to Inspection Required. Otherwise, the title shows a formatted date of when the last inspection was done. While configuring the pop-up, click Add under Attribute Expressions. This code requires a layer that has the last inspection date in an entry InspectionDate. Click Edit next to Custom to give your calculated entry a name. Click OK to create your calculated entry. Delete the Pop-up Title and click the add button (+) next to it. Select your new calculated entry. Click OK to save your pop-up changes. View the pop-up in your map. The title reflects your calculated entry. When you view the pop-up in Collector, the same title displays. For help with Arcade, see ArcGIS Arcade. For additional example expressions, see the Arcade expressions repository on GitHub. Arcade expressions aren't supported in Collector Classic. Arcade expressions are limited to the information within a single form, and can't access information in other forms (for example, from two different assets). If your assets have bar codes or QR codes, scan the bar or QR codes with Collector and populate one or more entries based on the scan. In Collector, all text and numeric entries contain an option for scanning a bar or QR code. When your mobile worker chooses Scan Bar or QR Code , the device's camera app opens and reads the bar or QR code. The information it contains populates the entry selected when the scan is done. Collector supports the bar and QR code formats supported by iOS. See Machine Readable Object Types. Scanning bar or QR codes isn't supported in Collector Classic. If your data supports attachments, your mobile workers may need to view them. Check the Show feature attachments as links check box if you want the attachments to be visible when mobile workers are viewing forms. This won't affect their ability to add attachments, but without it they can only see attachments while editing. If your data includes high-accuracy metadata, your mobile workers shouldn't be able to edit it. You should consider whether your mobile workers even need to read it. Make sure to set all the high-accuracy metadata entries as read-only (disable editing on them), and possibly not visible. You can set them the same way you set what other entries are included and editable. If displaying high-accuracy metadata, you should also format the numbers to use an appropriate number of decimal places. If displaying the fix time, format the date. If your data includes related assets, observations, or reports (inspections), your mobile workers may need access to them. Related reports must be accessed through the asset or observation to which they are related (tables can't be accessed directly). Related assets and observations can be accessed directly through the map or through the asset or observation to which they are related. To make the best forms for your mobile workers, configure the form for the related information as well as for the feature to which it is related, specifying that it includes the related information. Configure the form for the related information following the same guidelines you use to configure any form. All the settings and recommendations in this topic apply. Pay special attention to the title of the form for the related information: if the feature or table it is related to has multiple related forms, the mobile worker sees a list of the titles when choosing a related form. It is easier for the mobile worker to choose the right related form if the title includes distinguishing information. To allow mobile workers access to the related information when viewing the asset or observation to which it is related, check the Show related data check box when configuring the form of the asset or observation to which it is related. If unchecked, mobile workers won't be able to add or edit the forms of related information through the asset or observation. If checked, click Sort Options and provide the field and order that specifies the presentation order of the related information. For example, if sorting inspections, it is common to sort based on the inspection date field and use descending order, showing the most recent inspections first. You might want to restrict the information that users enter into the form. Perhaps you have a set of choices you want honored, or a range of values that are valid for the entry. These are honored by Collector, but configured through your data. To provide a set of choices for a field, create a list of values (if using ArcGIS Online or ArcGIS Enterprise) or coded value domain (if using ArcGIS Pro). In Collector, mobile workers see a list of values they can pick for the field. To have a range of valid numeric values, provide a minimum and maximum value for it. If using ArcGIS Pro, this is done through a range domain. In Collector, mobile workers enter a value and it is flagged if outside the valid range. While the form contains invalid values, mobile workers can't submit the form. For details on configuring your data to restrict the values entered in the form, see Define attribute lists and ranges in ArcGIS Online, Define attribute lists and ranges in ArcGIS Enterprise, or Domains view in ArcGIS Pro. Using ArcGIS Enterprise to add and edit fields, including creating lists and setting minimum and maximum values on them, requires ArcGIS Enterprise 10.7 or later. There might be a default value you want set in the form. The form is prepopulated with default values in Collector. The default values come from your data. To provide default values, see Add or delete a field in ArcGIS Online, Add or delete a field in ArcGIS Enterprise, or Fields view in ArcGIS Pro. Using ArcGIS Enterprise to add fields, including setting default values on them, requires ArcGIS Enterprise 10.7 or later. Your data might have entries that you require your mobile workers to provide. For example, if all inspections require an inspection data, make that a required entry so that mobile workers have to provide it before submitting their inspection. Required entries are honored by Collector and show mobile workers as asterisk next to the label, as well as preventing submission until a value is provided. Indicate an entry is required as part of configuring your data by not allowing it to be null. If you're using ArcGIS Pro, version 2.1 or later is required. If you're using ArcGIS Enterprise, version 10.7 or later is required. If using an earlier version of ArcGIS Pro or ArcGIS Enterprise, you'll need to run a script (Reset required fields) on your hosted feature layer. See Require the information you need from the field.